When you purchase a vehicle, you know that regular oil changes are essential for their performance and longevity. Many car owners find opting for the minimum or standard oil options because they do not understand the difference. In order to maintain the quality of your vehicle's engine, choose a full synthetic oil change when maintenance is required. Full synthetic oil is a premium oil that maintains all motor functions to their highest performance level. Maintaining oil changes for all vehicles are necessary, but using full synthetic oil is something that you make sure is being used on your vehicle. Full synthetic oil is necessary for your vehicle, no matter how old or the condition. This oil type is necessary because of the premium maintenance level it has on the motor. Although a standard oil will allow the motor to perform, its' protection level and performance are not at its potential because of the oil used. Also, the natural wear and tear on a vehicle can slow due to this usage. Motors in vehicles that use full synthetic oil regularly have the tendency to last longer mileages before needing repair or replacement. If you choose not to begin full synthetic oil maintenance on your vehicle, expect the mechanical wear and tear to begin deteriorating sooner. While using Full Synthetic Oil at any point during the maintenance of your car has benefits, they can be maximized with earlier use. Attempting to use this treatment much later when the wearing of the vehicle is significant will not have the desired benefit and maximized motor protection that can be provided if you begin that premium treatment now. 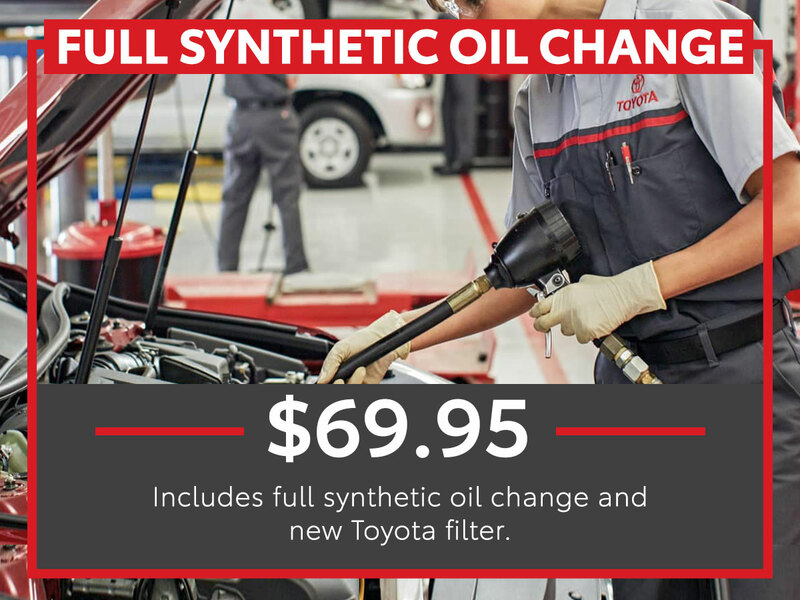 Tom Wood Toyota in Indianapolis wants you to consider their services for your next full synthetic oil change service. When you are serviced with Tom Wood Toyota, you can expect the premium service at our state-of-the-art collision center that allows our technicians to properly service your vehicle. Expect a complimentary car wash with each visit, and if you would like to come early, then enjoy our early bird service. Our technicians have certified training that is updated and are ready to service your vehicle. If you need to leave and return later for pickup or your vehicle needs overnight attention, our dealership will provide you with transportation and rental services. A champion of the area, Tom Wood Toyota proudly supports the local Indianapolis Zoo, St. Mary's Child Center, Best Buddies Indiana, and other local staples of the Indianapolis metropolitan area. Give us a call and let us service your car today.